It's time for another giveaway from Full of Grace Creations! This weeks giveaway is a Saint Philomena Chaplet. The chaplet consists of red glass beads and three large freshwater pearls! Saint Philomena is a helper of students at examinations, the sick in desperate cases, and mothers at childbirth. "This chaplet consists of three white beads and thirteen red beads. On the medal say the Apostles’ Creed to ask for the grace of faith. On each of the white beads say an Our Father in honor of the three Divine Persons of the Blessed Trinity in thanksgiving for all favors obtained through St. Philomena’s intercession. Hail, Oh holy St. Philomena, whom I acknowledge, after Mary, as my advocate with the Divine Spouse, intercede for me now and at the hour of my death. Hail, O illustrious St. Philomena, who shed so courageously your blood for Christ! I bless the Lord for all the graces He has bestowed upon thee during thy life, and especially at thy death. I praise and glorify Him for the honor and power with which He has crowned thee, and I beg thee to obtain for me from God the graces I ask through thy intercession." 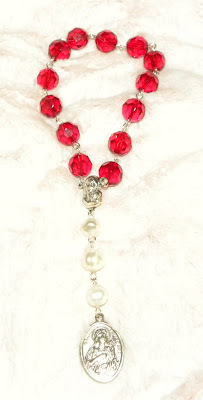 I would love to have this chaplet to take with me when I'm in labor with Bunny! It's just beautiful, like all your work! As always, I'm covering all the entries. I'm already a follower, I tweeted and FB-ed this giveaway, and blogged about it (http://loveinkcoffee.blogspot.com/2011/01/saint-philomena-giveaway.html). Thanks for another great giveaway, Cam!